Na, kaip sakiau, rašiau eilėraščius, kurių beveik nespausdinau, nors kartais jie, vis dėlto, patekdavo į spaudą. Ir viena mažutė knygelė Vilniuje vis dėlto išėjo, vadinosi “Kalbos ženklas”. Kaip tik tą knygelę Brodskis parodė Milošui. Na, o Milošas išvertė vieną eilėraštį, išspausdino “Kultūroje”. Čia mes kaip tik dabar kažkas užsiminė, kad “Kultūros” redaktorius buvo Ježi Gedroicas, iš lietuvių, tarp kitko, bajorų, Giedraičių giminės. Labai žymus publicistas, labai žymus politikas, ne taip seniai irgi miręs Paryžiuje, ir su juo man netgi teko, kai aš jau buvau emigrantas, su juo teko pabendrauti, ir kuo irgi didžiuojuosi ir laikau tai svarbiu savo gyvenimo įvykiu. Well, as I’ve said, I wrote poems which I largely didn’t publish, even though, in spite of everything, they sometimes found their way into print. And a small book did come out in Vilnius. It was called Kalbos ženklas [The Sign of Speech]. It was this book that Brodsky showed [Czesław] Miłosz. Miłosz translated one of those poems and had it published in Kultura. Somebody just mentioned that the editor of Kultura was Jerzy Giedroyc – descended, by the way, from the Lithuanian Giedraitis family of nobles – a very well known publicist, a very well known politician – he also died not so long ago in Paris – and with whom I even had the occasion to spend some time when I was an émigré, and that’s something that I’m proud of and consider to be an important event in my life. 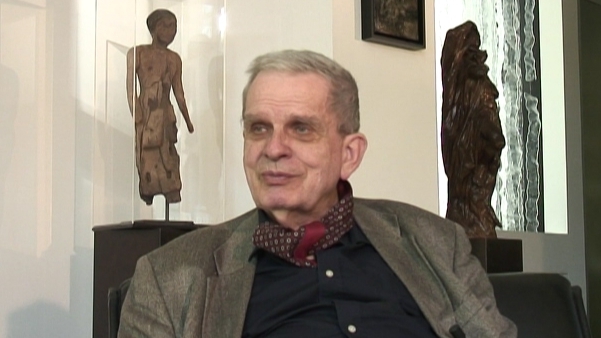 Born in 1937, Tomas Venclova is a Lithuanian scholar, poet, author and translator of literature. He was educated at Vilnius University and later at Tartu University. As an active participant in the dissident movement he was deprived of Soviet citizenship in 1977 and had to emigrate. Between 1977 and 1980 he lectured at University of California, Berkeley, where he became friends with the Polish poet Czesław Miłosz, who was a professor of Slavic Languages and Literature at the school, as well as the Russian poet Joseph Brodsky. He is currently a full professor at Yale University.